Have a problem with your sewing machine? Ask the Industrial Sewing Machine Man! Sewing Speed: Max 720 Stitches/min. Weight(machine only): 15.6 lbs (7.1kg). Dimensions: 415(W) x 300(H) x 190(D)mm. 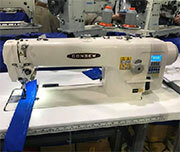 JUKI launches the new "direct-drive, high-speed, lockstitch sewing system with automatic thread trimmer" DDL-9000CF. 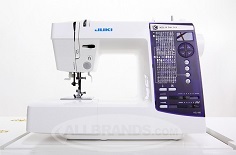 This is the newest flagship lockstitch machine. Thanks to the digitalization, Optimum adjustment values required to produce high-quality seams can be stored, on a material-by-material basis, in memory and can be reproduced with ease.